Brazilian novelist Paulo Coelho is one of the most popular writers of recent times, his most famous book "The Alchemist" selling over 35 million copies to date. Global Connections takes two very different countries and asks you to find the connections. Part of CNN's Connect the World, this week we've picked two giants on their respective continents: Brazil and Nigeria. Here we ask novelist Paulo Coelho what he loves about Brazil. (CNN) -- One of the most widely read authors of recent times, Brazilian-born novelist Paulo Coelho talks exclusively to CNN about what Brazil means to him. Born and raised in Rio de Janeiro, the best-selling author of "The Alchemist" dreamt of becoming a writer from an early age, but was stifled by his parents, who insisted he follow his father's footsteps and become an engineer. But only a year into his studies the adventurous young Brazilian had dropped out, and by the 1970s had made a name for himself in Brazil's politically infused artistic movement, becoming a successful songwriter and co-creator of the controversial comic strip "Kring-ha." However, his messages were viewed as left-wing and dangerous: Coelho was branded a "subversive" by Brazil's then-ruling military government and was arrested and tortured. Yesterday we thought we were just instruments of a most powerful game, beyond our control. Today we are proud of being Brazilians. --Author Paulo Coelho on life before and after Brazil's military dictatorship. The experience had a strong affect on the writer and by the 1980s, Coelho had abandoned his artistic lifestyle and settled down. However, his passion for writing continued and after a few unsuccessful first starts, Coelho hit major success with his 1988 novel, "The Alchemist." Initially only given a small print run, the book eventually became a global bestseller, garnering numerous literary awards -- translated into 67 languages and edited in more than 150 countries. Now a household name, the novelist and United Nations messenger for peace talks to CNN about what he loves most about his country. CNN: What does Brazil mean to you? 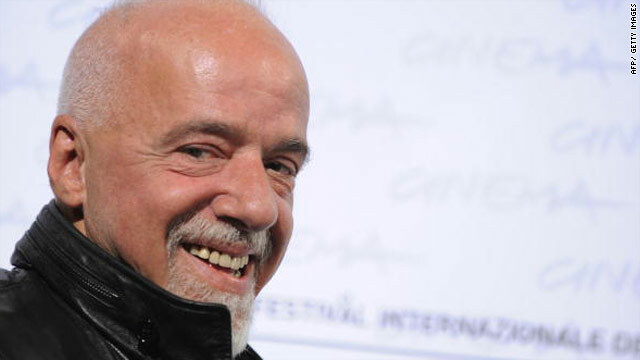 Paulo Coelho: Brazil is my way to see the world. Being born in that country means: "you don't have a wall separating the physical reality from the magical reality." Therefore, since my childhood I learned that to understand the world we need to go further and take the risks of sailing in unknown seas. CNN: What do you like most about Brazil today? PC: My people. Hard working, filled with fun and enthusiasm, understanding that if hope exists, there is room for everything else. CNN: Where are your favorite places to go in Brazil? PC: There are many, so I need to single out just one: Copacabana Beach, in Rio de Janeiro, where I live. Every hour I go to the window and look to all the transformations that a day may bring -- the light, people walking, vendors etc. And then I smell the sea, and this smell takes me to a beautiful place inside of my soul. CNN: What are your fondest memories of Brazil? PC: Every single day that I spend here. My childhood and its innocence, my teenager period and its rebellion, my young adult years and the freedom to believe that everything was changing, my adult years -- fighting for my dream of being a writer, and having the help of my friends. CNN: How has Brazil changed in your lifetime? PC: Most of my young years were spent under the boots of the military. I was arrested three times and tortured once. Little by little the political situation changed -- and this was the most important change of my lifetime. Yesterday we thought we were just instruments of a most powerful game, beyond our control. Today we are proud of being Brazilians. CNN: What does the future hold for Brazil? PC: I don't know. But as a Brazilian poet said: "Don't lose your hope in difficult times: God was born in Brazil".